The modern interface, bright graphics, beautiful animation and remembering sound effects will not let you get bored. 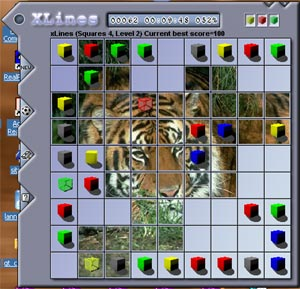 Besides the traditional game with tremendous number of options, the game has a unique mode - lines with pictures. Now you can not only to gather balls in lines (squares, crosses or blocks) but also reveal pictures, proceeding by this to the next level. The best scores are published in Internet. You can find dozens of skins, sets of pictures, and sounds for the game on our site. As well you can create your own skins, sets of pictures and sounds by means of the powerful, simple and convenient SDK (Skins Development Kit). Multilanguage interface (including English, German, Hungarian, Russian and Ukrainian).